← Creating community is easier than you think. Although recycling is crucial to the future of our planet, it still contributes to pollution. Recycled waste builds up and produces toxins when melted down. By precycling, you lower the amount of products that need to be recycled. This involves purchasing products with minimal packaging and maximum reusability. When you precycle, you save waste from landfills by reusing, repairing, and donating what you already have. Carry reusable bags. Bring your own bags when running errands. If you forget your bags always choose paper over plastic. Paper bags can be reused and can be recycled much easier than plastic ones. Some grocery stores will even enter you into a weekly drawing for free groceries if you bring your own bags. Who doesn’t want to be a winner? Baggu make an amazing assortment of reusable shopping bags in more than 30 colors. Pick products with minimal packaging. Avoid buying items that have multi-layer packaging bigger than the product itself. 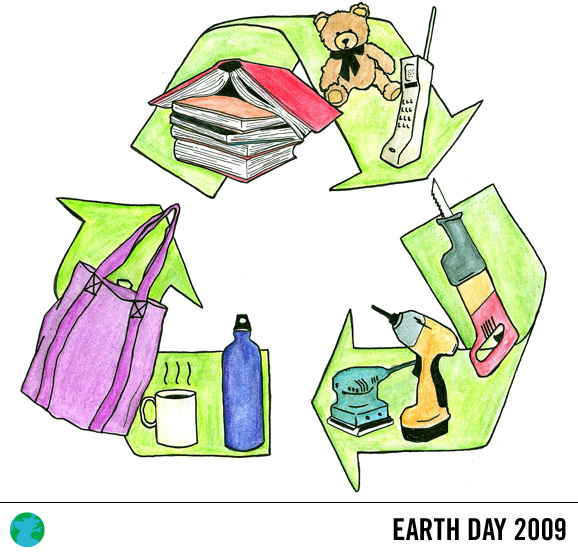 In most cases you can’t avoid packaging all together, so purchase products made from recycled materials. Refuse junk mail. Be the boss of your mailbox with services like Tonic Mail Stopper and Proquo. Give away, don’t throw away. Donate old clothing, toys, and electronics to your local Goodwill or community center. If you have old magazines and books you want to get rid of donate them to local hospitals and libraries. Repair broken items. Always try and repair before you throw away. How to Mend It is a wonderful resource for how to fix just about anything. For further repair advice, read Platform21’s Repair Manifesto. Drink from refillable bottles and mugs. Kick your water bottle addiction by buying a Sigg. If you buy a coffee every morning, bring your own reusable mug or try I’m Not a Paper Cup for coffee shop trips. Dispose your disposable habit. Eliminate the use of one-time use products such as razors, plastic eating utensils, and cigarette lighters. Instead buy reusable, refillable, and washable items. Rent it, don’t buy it. Borrow or rent tools you wont use everyday. Many hardware stores have the rent option instead of buy.